Two prominent positions were recently handed out in the European Union. 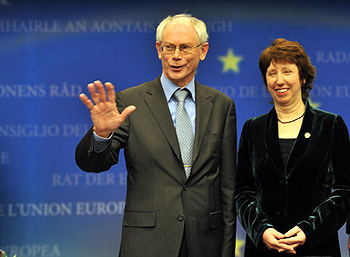 Belgian Prime Minister Herman van Rompuy was named the first president of the European Council, and Britain's Baroness Cathy Ashton was granted the role of high representative of foreign affairs, otherwise known as Europe's foreign minister. Europe's multi-institutional build-up, chaired by different figures, will demand more patience to see how and if powers will shift. Some careful and intermediate conclusions can be drawn out, though. Europe is unlikely to head or aim for world politics. This has nothing to do with capabilities, only with the fact that van Rompuy works a lot more behind the scenes than charismatic persons such as Tony Blair do. Although he seems up to the job, van Rompuy has been prime minister of Belgium for only about a year and has not as much experience as several other candidates. He has, however, led Belgium out of chaos, which fought rough political battles in stormy waters over recent years. One might almost think that anyone capable of leading Belgium will be capable of leading Europe, but what does his denomination say about Europe's prospects? Since the president chairs meetings of the European Council, it is unlikely he will be seen on global issues in any way comparable to Obama or Clinton. This would have been possible with Blair, but van Rompuy is better at overcoming difficulties and stimulating compromises than he is at taking stage and inspiring people. This isn't necessarily bad, especially not with his intellectual background and image. He is well respected, and with his language skills the job to get leaders of E.U. countries closer together will be much easier, even if he won't be a strategic player in global politics. He may also prove more capable than most of his competitors in his ability to think in pragmatic, critical terms—especially in comparison to Dutch candidate Balkenende (who denied availability) and Luxembourg's Juncker. The latter's ties with the U.K. will hardly bring the isles any closer, and he is in any case better suited for financially orientated tasks. The second new job went to Cathy Ashton, who has worked as a European trade commissioner for a year. Her case may leave people more puzzled as to why she got the job. Her background reveals little experience that makes her suitable for an assignment people held to rival the president's in power. She never served as minister in England, nor has she participated in any public elections. British Foreign Secretary David Miliband was rumored to get the job at first, but he supposedly stayed behind in order to rescue his Labor Party from a huge defeat in next year's elections. There is another reason to consider. The longer people discussed potential people to fill in these newly created spots, the louder the voice became that called for a woman to take on the job. Many wanted to see a woman holding an important post in Europe. The fact that she has worked under Barrosso, the current president of the European Commission, will probably have done her some favors as well, since he is at least rumored to have given her his support. It's a funny thing that people kept their focus on an English candidate. There are several "good" reasons for this. The first is the U.K.'s relationship with the European Union. They're not in the middle of the heat; they want to keep as much power on their islands as they can. The one thing that they intensely keep track of, however, is foreign policy. When it comes to Afghanistan and Iraq, the Balkans and Israel, England leads. So it was perhaps natural that an Englishman, or Englishwoman, get the job. Strategic too, because Europe got bigger, and with NATO and the U.N. it has long since kept an eye on security and armies. But more than enough ambitions and rumors are around to tell us that a more centralized European army will one day be realized, or at least strived for. And both the French and the Germans will know their chances are slim to none to materialize this without U.K. support. Time, as always, will tell what is in store for the E.U. With less prominent figures leading Europe's way, we can draw several intermediate conclusions. The first is that a power struggle between the foreign minister, the council president and the commission president is less likely than before, because of egos with less need of inflating. With van Rompuy as the newly elected president, European's have someone who has a reasonably clean sheet, which in political terms means few opponents. In combination with Ashton, who is less widely known but nevertheless liked, we can have reasonable hopes for a future of cooperation rather than proliferation of individuals. A good relationship with foreign representatives might do some good, too, and Ashton's former job as trade commissioner might be a nice stepping-stone.